This dictionary and index comprises a selection of modern and everyday language that will be extremely useful for learners of the Maori language. it has a broader scope than traditional dictionaries, so as well as the words one would usually expect in a dictionary, it also includ... read full description below. This dictionary and index comprises a selection of modern and everyday language that will be extremely useful for learners of the Maori language. 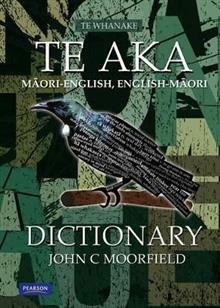 it has a broader scope than traditional dictionaries, so as well as the words one would usually expect in a dictionary, it also includes: encyclopaedic entries designed to provide key information about plants, animals (including sh and insects), stars, planets, heavenly bodies, important Maori people, key ancestors of traditional narratives, tribal groups, ancestral canoes, song types, traditional musical instruments, Maori names for institutions, country names, place names and other proper names, explanations of key concepts central to Maori culture; comprehensive explanations for grammatical items, with examples of usage idioms and colloquialisms. These have all been included because they are important in communicating in a Maori context, and contribute to understanding and speaking the language in a natural way. While this dictionary is designed to stand alone, it not only contains all the words used in the Te Whanake series of narrative texts and resources, but is indexed to the Te Whanake series, thus giving quick access to topics, maps, illustrations, idioms, colloquialisms, proverbs, tribal sayings, grammar and usage explanations. John Moorfield, QSO, BA (Auckland), MEd (Wales) , LittD (Otago), RSA/Cambridge CTEFLA is a professor at Te Ara Poutama, the Faculty of Maori Development and Te Ipukarea, the National Maori Language Institute, at Auckland University of Technology. He moved there in 2007 after eight years teaching in secondary schools at Ngaruawahia High School, Wesley College and Tuakau College, 21 years at The University of Waikato and ten years at the University of Otago.